The complete CJWinter line of tooling for cold root rolling rotary shouldered connections is compatible with any CNC lathe, and our in-house engineering staff is always available to help with technical manufacturing situations. CJWinter once again expanded its cold root rolling product line to include the latest 11069 Series - designed for use in smaller rotary shouldered connections. The 11069 allows you to increase the fatigue resistance of your connections without slowing down your process. The 11069-SA Series will roll all standard API Rotary Shouldered BOX connections in the following ranges. No external power device needed: Every tool is self-contained, so there’s no need for an outside power source to pressurize the roller piston. The only thing you need is a socket wrench. 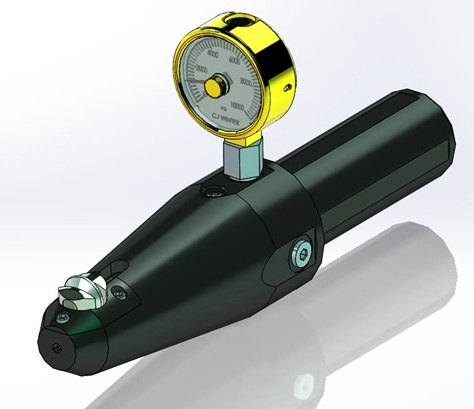 Internal accumulator: A standard feature on all CJWinter tools, the internal accumulator allows engineers to correctly roll the critical run out thread with full pressure through the very last scratch. Error-proof loading system: Using this system, the wheels CANNOT be loaded backwards! An asymmetric hub system works in conjunction with the roll holder to eliminate a common but costly mistake. No conversions: The values of hydraulic pressure and roller force are 1:1, simplifying the process and reducing chances for error. Liquid-filled pressure gauge: Values can be observed post-cycle, rather than during the cycle where moving parts and coolants can restrict the view. IP67 rated against coolant ingress, and supplied with NIST traceable certification. CJWinter has led the industry in supplying thread rolls and thread rolling tools around the world for 60+ years, and that experience informs the design for the 11069 Series, specifically crafted for Rotary Shouldered Connections in the petroleum industry. Oil field and drilling tools demand strong connections. With tools like the 11069 Series, cold root rolling burnishes the thread root in rotary shouldered connections, strengthening them and providing a solution to costly, over-stressed or even failing thread roots. The process helps to avoid joint failures and can prolong the service life of drilling connections by three to five times. For more information about CJWinter's tools, please don't hesitate to contact our team today.